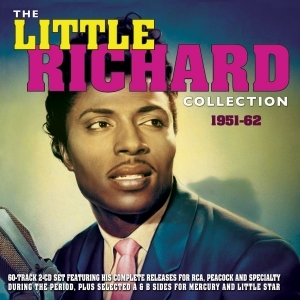 Little Richard was one of the unique personalities who were at the core of the explosion of rock ‘n’ roll in the middle and later years of the 1950s, his highly individual piano style combining with his unmistakeable vocal delivery and extraordinary stage persona to bring him a succession of landmark hits like “Tutti Frutti”, “Long Tall Sally”, “Lucille” and “Good Golly Miss Molly” which helped inspire the British Invasion bands of the ‘60s and have become staples of rock ‘n’ roll bands the world over. His was not a rise to instant stardom, however, making his first records in 1951 for RCA before recording for the Peacock label and then joining Specialty, for whom he had his biggest hits, later making religious records for Mercury and other smaller labels. This great-value 60-track 2-CD set comprises almost all the A & B sides which he released during the first, and most important, decade or so of his career – we have left out one or two of the gospel tracks he released as singles in the late ‘50s and early ‘60s so that we could include the Specialty EP and album tracks which were not otherwise released on singles. We also include both sides of a rarely-heard record he made with The Upsetters in 1962. It makes for a thorough and extremely entertaining overview of his early career, and naturally includes the 21 chart entries he had in the US and UK during that time among some less well-known material.